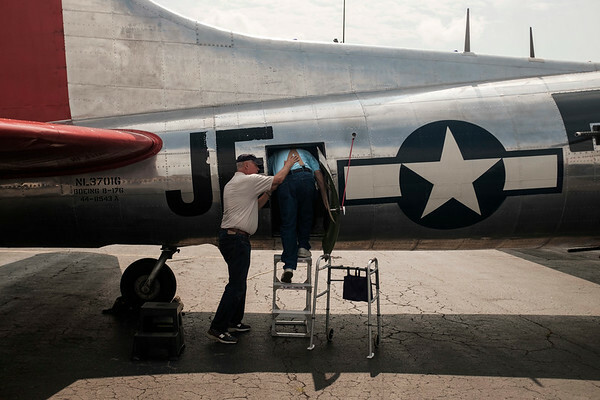 JOED VIERA/STAFF PHOTOGRAPHER-Jim Lawrence helps Roy Phillips, a WW2 veteran, who served in the 457th Anti-Aircraft Artillery Battalion, onto the Madras Maiden, a WW2 era B-17 "Flying Fortress" outside of Prior Aviation at the Buffalo International Airport in Buffalo N.Y. on Monday, Aug. 7, 2017. . Although Phillips never flew on a B-17 during the War, he claims to have seen thousands of the aircrafts in flight while stationed as a gunner in France during the Battle of the Falaise Gap. Tours and flights on the Maiden are available to the public at Prior Aviation FBO on August 12th and 13th.